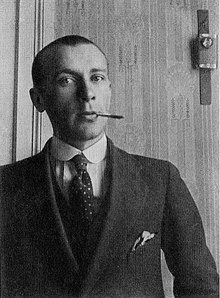 Mikhaíl Afanasyevich Bulgakov (/bʊlˈɡɑːkəf/; Roushie: Михаи́л Афана́сьевич Булга́ков, pronounced [mʲɪxɐˈil ɐfɐˈnasʲjɪvʲɪtɕ bʊlˈɡakəf]; Mey 15 [A.S. Mey 3] 1891 – Mairch 10, 1940) wis a Roushie writer an playwricht active in the first hauf o the 20t century. ↑ "Bulgakov". Collins English Dictionary.